If you are looking for experts in pavers and paver installations, we at LR Landscaping & Pavers are your perfect option. We have been serving owners of business establishments and private properties in California for many years, including those in Sacramento, Auburn, Roseville, Folsom, Citrus Heights, Rancho Cordova, Rocklin, Lincoln, Fair Oaks and Yuba City. Whether you require a modern driveway or an old-world-inspired patio, you can be sure that you’ll get stunning structures that will last a lifetime. We are known for our exceptional work quality and professionalism of our staff, and we offer clients the best value for their money. Call us now at 916-502-6037 so we can discuss further how we can make your properties more functional and attractive with our professionally built paver installations. One of the secrets to creating stunning and durable outdoor structures is choosing the right materials. At LR Landscaping & Pavers, we only use premium grade pavers from trusted manufacturers and suppliers. Through the years, we have managed to satisfy our clients’ requirements and demands by strictly adhering to our policy of using top-quality pavers on all our paver installations. Our past clients can attest to this because the amenities that we’ve created for them years back still look stunning until today. Paver Patios: We have built dozens of patios for clients in Sacramento and other California cities. From modern patios to Mediterranean-inspired ones, the paver patios that we create are done according to our clients’ specifications. Paver Driveways: If you’re not happy with your current driveway or if you want a custom driveway for your dream property, we are the right people to hire. We have built countless stunning paver driveways that are absolutely tough. Our crews know the needed preparations and ensure the proper installation of each paver unit. A lot of our paver installations include building driveways for residential clients, so we know the right methods and techniques to use. Paver Walkways: Enjoy leisurely walks around your property with our gorgeously designed paver walkways. 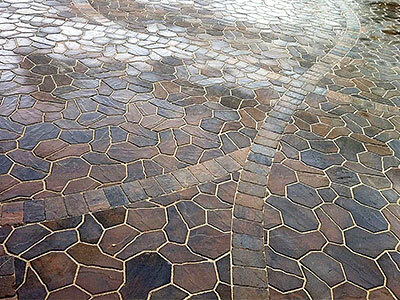 We commonly use slip-resistant pavers and permeable ones to minimize slip and fall accidents. Pool Decks: Whether it’s a view deck or a pool deck that you need, we are just one phone call away. We will make sure that your desired decks are built to serve your purpose and satisfy your design needs. All our paver installations are performed by certified and experienced personnel. Our crews are highly creative, so you can look forward to superbly designed and crafted paver structures. We have served so many property owners in Sacramento, CA and nearby cities, which is why we’re trusted and known in these areas. We also have access to all types of pavers, such as interlocking concrete, clay bricks, and natural stone pavers. We also recommend specific paver types for clients who are unsure of the right paver to use. We simply ask them their expectations and needs to determine the perfect paver type for their desired outdoor amenities. Meanwhile, our rates are truly competitive, so you won’t have to worry about going over your budget. Call us soon and let us build you stunning paver amenities that you will enjoy for decades to come.